Business Secretary Lord Mandelson has criticised a Tory MEP for citing Enoch Powell as a political influence. 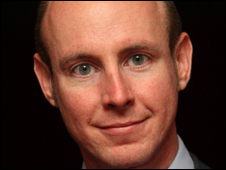 Daniel Hannan told a website the 1960's anti-immigration campaigner understood "the importance of national democracy". The Conservatives said he had not been talking about Mr Powell's views on immigration but Lord Mandelson said it showed the "two faces" of the party. Mr Hannan later told the BBC he was a "libertarian" on immigration but had agreed with Mr Powell over Europe. The MEP caused controversy two weeks ago when he described the NHS as a "60 year mistake" on US television - prompting Tory leader David Cameron to say his party stood "four square behind the NHS" and saying of Mr Hannan: "He does have some quite eccentric views about some things." He also became a hit on the video sharing site YouTube, with a three minute speech in the European Parliament attacking Gordon Brown as the "devalued" leader of a "devalued" government. In an interview with US internet television channel Reason TV, he cited Mr Powell as a political influence, saying: "He was somebody who understood the importance of national democracy, who understood why you need to live in an independent country and what that meant, as well as being a free marketeer and a small-government Conservative." Mr Powell was sacked from the shadow cabinet by Ted Heath in 1968 for his "Rivers of Blood" speech about the dangers of mass immigration. Business Secretary Lord Mandelson said: "Yet again, we are seeing the two faces of the Conservative party: the one they want to present to the public and the one which attacks the NHS and praises Enoch Powell." And Labour MP Parmjit Dhanda urged Mr Cameron to rebuke Mr Hannan - pointing to former Conservative parliamentary candidate Nigel Hastilow, who wrote in a newspaper article that Enoch Powell was "right" on immigration and later resigned after criticism from senior Tories. Conservative sources said Mr Hannan would not be disciplined because his praise for Mr Powell had not referred to the late politician's stance on immigration. What is the NHS row really about?